Click the photo to view WSU’s peer reviewed guide. THE SALISH SEA is a unique and spectacular place consisting of a network of coastal waterways between British Columbia and Washington State, the Salish Sea includes the Strait of Juan de Fuca, Strait of Georgia, and Puget Sound. It offers beautiful scenery, a multitude of opportunities for recreation, and wonderful fish, shellfish, and wildlife. Whether you live directly along the shoreline or further inland, or on a lake or stream, your actions can go a long way toward helping to protect and preserve our way of life here. All 10 of the guidelines are on this website. 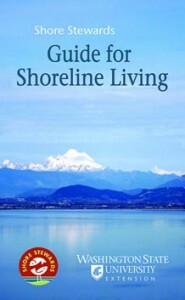 The WSU peer reviewed Guide for Shoreline Living is also available online at WSU’s Learning Library. A booklet (3MB) for is also available to download. We hope that your commitment to enjoy and protect our shorelines will include following the Shore Steward suggestions and guidelines.